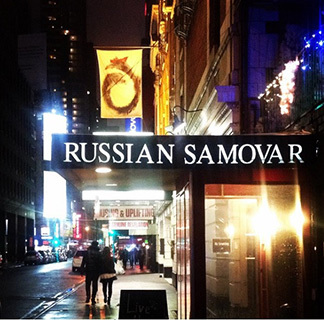 We took a "culinary tour" of Russia via dinner in New York City at the acclaimed Russian Samovar Restaurant and Piano Bar located at 256 West 52nd Street just off 8th Avenue in the heart of the theatre district. Since 1986, the Russian Samovar Restaurant and Piano Bar has attracted diners not only for the delcious traditional Russian cuisine and savory and sweet house infused vodkas, but also for the music. We had a lovely dinner at the Russian Samovar Restaurant and Piano Bar on Friday,September 21, 2018, where the ambience was warm and inviting. Artwork and photographs lined the storied walls, red fringed lamp shades casted a warm hue to the room, tables were dressed in pristine ivory linens and colorful fringed runners, and miniature silver samovars. 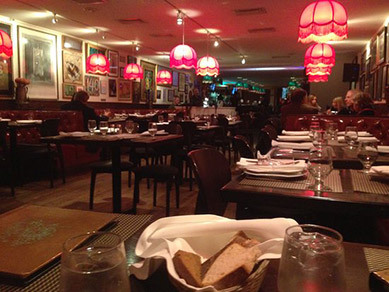 Tufted dark red leather banquettes lined the walls and bentwood chairs with red leather seats flanked the tables. 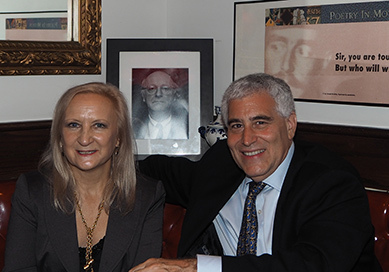 We sat at the Brodsky table, named for owner Roman Kaplan's friend and business partner, the Nobel Award Winning poet Joseph Brodsky (1940 - 1996), where his photograph prominently holds a place of honor in the corner table. 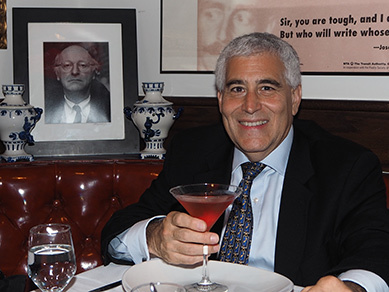 At the front of the long dining room, a pianist played a white baby grand owned by llegendary dancer Mikhail Baryshnikov, a friend and business partner of Roman Kaplan. The restaurant's menu featured a delight of traditional Russian food including Pirozhok - classic country pastry filled with various savory fillings, Vareniki - traditional Russian dumplings filled with a variety of savory and sweet fillings, Kulebyaka - salmon filet, garden vegetables, and herbs stuffed in a delectable puff pastry, Chicken Kiev - the restaurant's famous dish of succulent tender chicken breast stuffed with herbed butter, lightly breaded and baked and served with creamy mashed potatoes, Seafood Blinchiki - baby shrimp and scallops wrapped in blini, served with a light saffron sauce and garnished with red caviar, and Beef Stroganoff - Russia's classic dish of lean tenderloin and sautéed mushrooms in a mushroom cream sauce, served over egg noodles, mashed potatoes, or kasha, to name but a few. 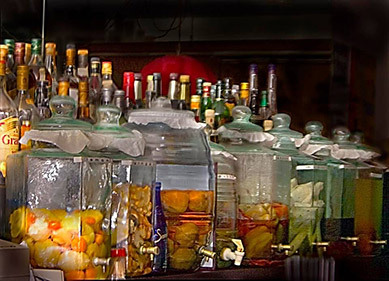 Russian cuisine and vodka go hand-in-hand, and in addition to their premium vodka offerings, the bar creates their own house-infused savory and sweet vodkas, which can be enjoyed as a shot or in one of their cocktail recipes. Although we are not fans of mass-produced flavored vodkas as they are usually too sweet for our palates, we boldly explored both their sweet and savory vodkas to great satisfaction. From their savory infused vodka menu, which included Coriander, Cucumber, Dill, Garlic, Ginger, Horseradish, Mint, Pepper, and Tarragon, we sampled the Ginger vodka, which was lovely with one ice cube to chill it. Perfectly infused, the ginger vodka had minute amounts of ginger pieces and the right balance of ginger for flavor yet was not overpowering. From their sweet infused vodka menu, which included Apple Cinnamon, Cherry, Cranberry, Lemon, Mango, Peach, Pear, Plum, Pineapple, Pomegranate, and Raspberry we sampled the Cranberry vodka in their "1986" Infused Vodka Martini, which was very tasty and not sweet. 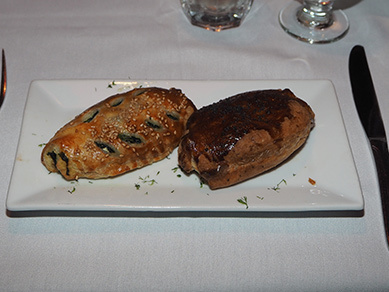 We began our dining experience with their hot appetizers - a selection of Vareniki tender dumplings filled with potato, and mushrooms, sautéed in butter with mushrooms and onions, and Pirozhok - Russia's classic country pastry, one filled with potato mushroom, and the other with spinach. 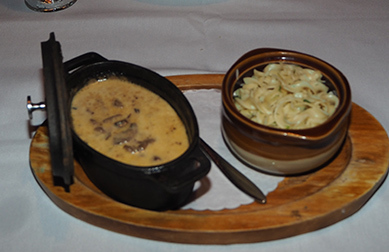 For one of our main courses, we sampled the most traditional of Russian recipes, their Beef Stroganoff, which was lusciously presented as tender beef strips in a mushroom cream sauce with a touch of cognac in an oval cast iron pot, with an accompanying pottery crock holding tender, buttery egg noodles. This was Russian comfort food at its best. 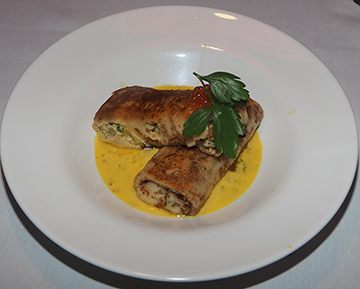 For our other main course, we selected the Seafood Blinchiki, which were two large blinis filled with a delectable mixture of baby shrimp and scallops served with a light saffron sauce and garnished with red caviar; so delicious and so filling. The dessert menu had many Russian favorites including Medovik- lightly sweet layered honey cake, Zapekanka- traditional cheese cake, Le Smetannik- sour cream cake, in addition to many more. 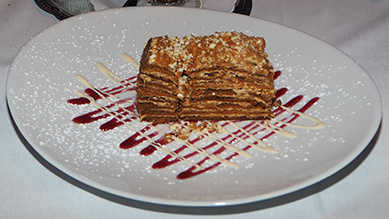 We opted to share the Medovik, which was heavenly and consisted of finely cut layers of cake delicately sweetened and artistically presented with zig-zags of flavor for color and taste. As the saying goes, when in Russia, or in this case, at the Russian Samovar Restaurant and Piano Bar, we decided to finish our dining experience by partaking of the Russian Samovar Tea, which was served in glass mugs along with conserved cherries and lemon. 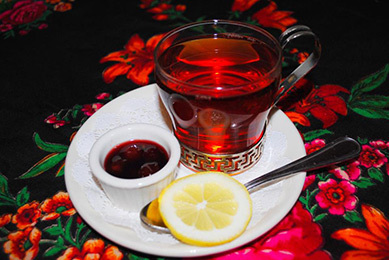 To prolong the enjoyment of the tea, you take a sip of tea, then a cherry, then more tea; delicious! As a final parting, we each had a shot of the peach infused vodka, as we listened to the music of the Gypsy Fun Trio. It was a wonderful evening of dining and music at the Russian Samovar Restaurant and Piano Bar. The restaurant is open Monday from 5:00 pm until 2:00 am, Tuesday through Thursday from 12:00 pm until 2:00 am, Friday and Saturday from 12:00 pm until 4:00 am,and Sunday from 12:00 pm until 2:00 am. "Cuisine For Your Soul - Our dishes were created to soothe the soul in the harsh Russian winters or to relax you in the summer heat. Featuring seasonal hot and cold soups, hearty favorites like Chicken Kiev and Beef Stroganoff, and light, elegant fair like our extensive salad and caviar options, we have something for all seasons." "Russian Samovar is a major supporter of the art community, with poetry readings held throughout the year and a classically trained pianist performs nightly. It features live interactive theatre every Thursday with award-winning actors, performances from Opera Singer Michael Peeron Mondays, Gypsy Fun Trio on Fridays and Saturdays on violin and guitar playing traditional Russian music, and Jazz Blues Brunch on Sundays with the Uptown Jazz Company." 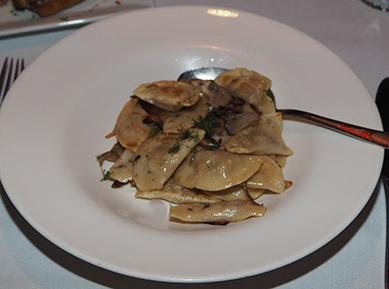 Read the Chefs' Recipes section for a traditional Russian recipe for Beef Stroganoff from Chef Lidijia Ragauskas for a delectable taste of the Russian Samovar Restaurant and Piano Bar located in the heart of the theatre district in New York City. ©September 2018. Luxury Experience. www.LuxuryExperience.com. All rights reserved.